In collaboration with HBO® and Game of Thrones, Johnnie Walker has unveiled the new White Walker by Johnnie Walker. Inspired by the Westeros’ infamous White Walkers, the limited edition Scotch Whisky was created by whisky specialist George Harper, alongside the small team of expert blenders at Johnnie Walker. Best served directly from the freezer, the Scotch has notes of caramelised sugar and vanilla, fresh red berries with a touch of orchard fruit and features Single Malts from Cardhu and Clynelish — one of Scotland’s most Northern distilleries. “Whiskies from Clynelish have endured long Scottish winters, not dissimilar to the long periods endured by the Night’s Watch who have ventured north of the wall — so it was the perfect place to start when creating this unique whisky,” says Harper. 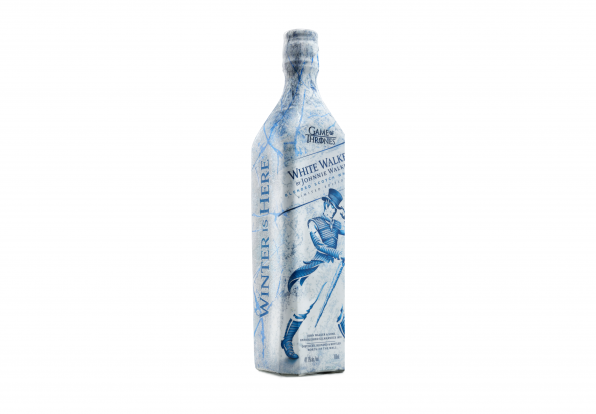 The bottle features an icy white and blue design with the iconic Johnnie Walker Striding Man now fashioned in armour. An unexpected graphic icy is revealed on the bottle when frozen, utilising temperature-sensitive ink technology.